Not to be confused with East Broadway or West Broadway, both also in Manhattan, or with Broadway theatre, commonly referred to as "Broadway". 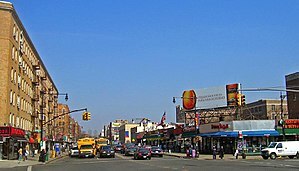 For the Broadway in Brooklyn, see Broadway (Brooklyn); for the Broadway in Queens, see Broadway (Queens); and for the portion in upper Manhattan and the Bronx, see also U.S. Route 9 in New York. For other uses, see Broadway (disambiguation). It is the oldest north–south main thoroughfare in New York City, dating to the first New Amsterdam settlement, although most of it did not bear its current name until the late 19th century. The name Broadway is the English-language literal translation of the Dutch name, Brede weg. 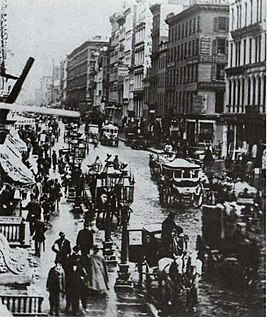 Broadway was originally the Wickquasgeck Trail, carved into the brush of Manhattan by its Native American inhabitants. Wickquasgeck means "birch-bark country" in the Algonquian language. This trail originally snaked through swamps and rocks along the length of Manhattan Island. Upon the arrival of the Dutch, the trail soon became the main road through the island from Nieuw Amsterdam at the southern tip. The Dutch explorer and entrepreneur David Pietersz. de Vries gives the first mention of it in his journal for the year 1642 ("the Wickquasgeck Road over which the Indians passed daily"). The Dutch named the road "Breede Weg". Although current street signs are simply labeled as "Broadway", in a 1776 map of New York City, Broadway is explicitly labeled "Broadway Street". 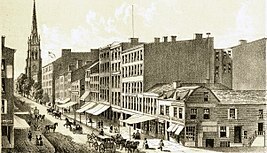 In the mid-eighteenth century, part of Broadway in what is now lower Manhattan was known as Great George Street. An 1897 City Map shows a segment of Broadway as Kingsbridge Road in the vicinity of what is now the George Washington Bridge. In the 18th century, Broadway ended at the town commons north of Wall Street, where traffic continued up the East Side of the island via Eastern Post Road and the West Side via Bloomingdale Road. The western Bloomingdale Road would be widened and paved during the 19th century, and called "Western Boulevard" or "The Boulevard" north of the Grand Circle, now called Columbus Circle. On February 14, 1899, the name "Broadway" was extended to the entire Broadway/Bloomingdale/Boulevard road. Broadway once was a two-way street for its entire length. The present status, in which it runs one-way southbound south of Columbus Circle (59th Street), came about in several stages. On June 6, 1954, Seventh Avenue became southbound and Eighth Avenue became northbound south of Broadway. None of Broadway became one-way, but the increased southbound traffic between Columbus Circle (Eighth Avenue) and Times Square (Seventh Avenue) caused the city to re-stripe that section of Broadway for four southbound and two northbound lanes. Broadway became one-way from Columbus Circle south to Herald Square (34th Street) on March 10, 1957, in conjunction with Sixth Avenue becoming one-way from Herald Square north to 59th Street and Seventh Avenue becoming one-way from 59th Street south to Times Square (where it crosses Broadway). On June 3, 1962, Broadway became one-way south of Canal Street, with Trinity Place and Church Street carrying northbound traffic. Another change was made on November 10, 1963, when Broadway became one-way southbound from Herald Square to Madison Square (23rd Street) and Union Square (14th Street) to Canal Street, and two routes – Sixth Avenue south of Herald Square and Centre Street, Lafayette Street, and Fourth Avenue south of Union Square – became one-way northbound. Finally, at the same time as Madison Avenue became one-way northbound and Fifth Avenue became one-way southbound, Broadway was made one-way southbound between Madison Square (where Fifth Avenue crosses) and Union Square on January 14, 1966, completing its conversion south of Columbus Circle. In 2001, a one-block section of Broadway between 72nd Street and 73rd Street at Verdi Square was reconfigured. Its easternmost lanes, which formerly hosted northbound traffic, were turned into a public park when a new subway entrance for the 72nd Street station was built in the exact location of these lanes. Northbound traffic on Broadway is now channeled onto Amsterdam Avenue to 73rd Street, makes a left turn on the three-lane 73rd Street, and then a right turn on Broadway shortly afterward. In August 2008, two traffic lanes from 42nd to 35th Streets were taken out of service and converted to public plazas. Additionally, bike lanes were added on Broadway from 42nd Street down to Union Square. 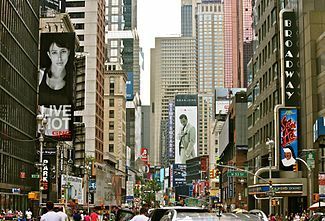 Since May 2009, the portions of Broadway through Duffy Square, Times Square, and Herald Square have been closed entirely to automobile traffic, except for cross traffic on the Streets and Avenues, as part of a traffic and pedestrianization experiment, with the pavement reserved exclusively for walkers, cyclists, and those lounging in temporary seating placed by the city. The city decided that the experiment was successful and decided to make the change permanent in February 2010. Though the anticipated benefits to traffic flow were not as large as hoped, pedestrian injuries dropped dramatically and foot traffic increased in the designated areas; the project was popular with both residents and businesses. The current portions converted into pedestrian plazas are between West 47th Street and West 42nd Street within Times and Duffy Squares, and between West 35th Street and West 33rd Street in the Herald Square area. Additionally, portions of Broadway in the Madison Square and Union Square have been dramatically narrowed, allowing ample pedestrian plazas to exist along the side of the road. In May 2013, the NYCDOT decided to redesign Broadway between 35th and 42nd Streets for the second time in five years, owing to poor connections between pedestrian plazas and decreased vehicular traffic. With the new redesign, the bike lane is now on the right side of the street; it was formerly on the left side adjacent to the pedestrian plazas, causing conflicts between pedestrian and bicycle traffic. In spring 2017, as part of a capital reconstruction of Worth Square, Broadway between 24th and 25th Street was converted to a "shared street" where through vehicles are banned and delivery vehicles are restricted to 5 miles per hour (8.0 km/h). Delivery vehicles go northbound from Fifth Avenue to 25th Street for that one block, reversing the direction of traffic and preventing vehicles from going south on Broadway south of 25th Street. The capital project expands on a 2008 initiative where part of the intersection of Broadway and Fifth Avenue was repurposed into a public plaza, simplifying that intersection. As part of the 2017 project, Worth Square was expanded, converting the adjoining block of Broadway into a "shared street." For the concurrency with U.S. 9 north of 178th Street, see U.S. Route 9 in New York. Broadway runs the length of Manhattan Island, roughly parallel to the North River (the portion of the Hudson River bordering Manhattan), from Bowling Green at the south to Inwood at the northern tip of the island. South of Columbus Circle, it is a one-way southbound street. Since 2009, vehicular traffic has been banned at Times Square between 47th and 42nd Streets, and at Herald Square between 35th and 33rd Streets as part of a pilot program; the right-of-way is intact and reserved for cyclists and pedestrians. From the northern shore of Manhattan, Broadway crosses Spuyten Duyvil Creek via the Broadway Bridge and continues through Marble Hill (a discontinuous portion of the borough of Manhattan) and the Bronx into Westchester County. U.S. 9 continues to be known as Broadway until its junction with NY 117. 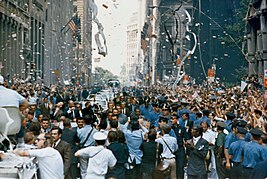 The section of lower Broadway from its origin at Bowling Green to City Hall Park is the historical location for the city's ticker-tape parades, and is sometimes called the "Canyon of Heroes" during such events. West of Broadway, as far as Canal Street, was the city's fashionable residential area until circa 1825; landfill has more than tripled the area, and the Hudson River shore now lies far to the west, beyond Tribeca and Battery Park City. 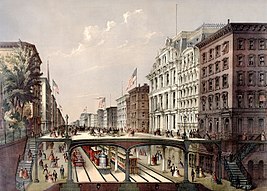 Because Broadway preceded the grid that the Commissioners' Plan of 1811 imposed on the island, Broadway crosses midtown Manhattan diagonally, intersecting with both the east-west streets and north-south avenues. Broadway's intersections with avenues, marked by "squares" (some merely triangular slivers of open space), have induced some interesting architecture, such as the Flatiron Building. At Union Square, Broadway crosses 14th Street, merges with Fourth Avenue, and continues its diagonal uptown course from the Square's northwest corner; Union Square is the only location wherein the physical section of Broadway is discontinuous in Manhattan (other portions of Broadway in Manhattan are pedestrian-only plazas). At Madison Square, the location of the Flatiron Building, Broadway crosses Fifth Avenue at 23rd Street, and is discontinuous to vehicles for a one-block stretch between 24th and 25th Streets. At Greeley Square (West 33rd Street), Broadway crosses Sixth Avenue (Avenue of the Americas), and is discontinuous to vehicles. Macy's Herald Square department store, one block north of the vehicular discontinuity, is located on the northwest corner of Broadway and West 34th Street and southwest corner of Broadway and West 35th Street; it is one of the largest department stores in the world. 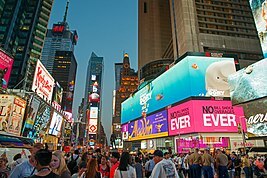 One famous stretch near Times Square, where Broadway crosses Seventh Avenue in midtown Manhattan, is the home of many Broadway theatres, housing an ever-changing array of commercial, large-scale plays, particularly musicals. This area of Manhattan is often called the Theater District or the Great White Way, a nickname originating in the headline "Found on the Great White Way" in the edition of February 3, 1902 of the New York Evening Telegram. The journalistic nickname was inspired by the millions of lights on theater marquees and billboard advertisements that illuminate the area. After becoming the city's de facto red-light district in the 1960s and 1970s (as can be seen in the films Taxi Driver and Midnight Cowboy), since the late 1980s Times Square has emerged as a family tourist center, in effect being Disneyfied following the company's purchase and renovation of the New Amsterdam Theatre on 42nd Street in 1993. Until June 2007, The New York Times, from which the Square gets its name, was published at offices at 239 West 43rd Street; the paper stopped printing papers there on June 15, 2007. At the southwest corner of Central Park, Broadway crosses Eighth Avenue (called Central Park West north of 59th Street) at West 59th Street and Columbus Circle; on the site of the former New York Coliseum convention center is the new shopping center at the foot of the Time Warner Center, headquarters of Time Warner. From Columbus Circle northward, Broadway becomes a wide boulevard to 169th Street; it retains landscaped center islands that separate northbound from southbound traffic. The medians are a vestige of the central mall of "The Boulevard" that had become the spine of the Upper West Side, and many of these contain public seating. 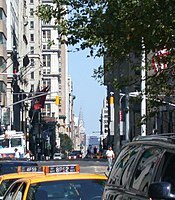 Broadway intersects with Columbus Avenue (known as Ninth Avenue south of West 59th Street) at West 65th and 66th Streets where the Juilliard School and Lincoln Center, both well-known performing arts landmarks, as well as the Manhattan New York Temple of The Church of Jesus Christ of Latter-day Saints are located. Between West 70th and 73rd Streets, Broadway intersects with Amsterdam Avenue (known as 10th Avenue south of West 59th Street). The wide intersection of the two thoroughfares has historically been the site of numerous traffic accidents and pedestrian casualties, partly due to the long crosswalks. Two small triangular plots of land were created at points where Broadway slices through Amsterdam Avenue. One is a tiny fenced-in patch of shrubbery and plants at West 70th Street called Sherman Square (although it and the surrounding intersection have also been known collectively as Sherman Square), and the other triangle is a lush tree-filled garden bordering Amsterdam Avenue from just above West 72nd Street to West 73rd Street. Named Verdi Square in 1921 for its monument to Italian composer Giuseppe Verdi, which was erected in 1909, this triangular sliver of public space was designated a Scenic Landmark by the Landmarks Preservation Commission in 1974, one of nine city parks that have received the designation. In the 1960s and 1970s, the area surrounding both Verdi Square and Sherman Square was known by local drug users and dealers as "Needle Park", and was featured prominently in the gritty 1971 dramatic film The Panic in Needle Park, directed by Jerry Schatzberg and starring Al Pacino in his second onscreen role. The original brick and stone shelter leading to the entrance of the 72nd Street subway station, one of the first 28 subway stations in Manhattan, remains located on one of the wide islands in the center of Broadway, on the south side of West 72nd Street. For many years, all traffic on Broadway flowed on either side of this median and its subway entrance, and its uptown lanes went past it along the western edge of triangular Verdi Square. In 2001 and 2002, renovation of the historic 72nd Street station and the addition of a second subway control house and passenger shelter on an adjacent center median just north of 72nd Street, across from the original building, resulted in the creation of a public plaza with stone pavers and extensive seating, connecting the newer building with Verdi Square, and making it necessary to divert northbound traffic to Amsterdam Avenue for one block. While Broadway's southbound lanes at this intersection were unaffected by the new construction, its northbound lanes are no longer contiguous at this intersection. Drivers can either continue along Amsterdam Avenue to head uptown or turn left on West 73rd Street to resume traveling on Broadway. Several notable apartment buildings are in close proximity to this intersection, including The Ansonia, its ornate architecture dominating the cityscape here. After the Ansonia first opened as a hotel, live seals were kept in indoor fountains inside its lobby. Later, it was home to the infamous Plato's Retreat nightclub. Immediately north of Verdi Square is the formidable Apple Bank for Savings building, formerly the Central Savings Bank, which was built in 1926 and designed to resemble the Federal Reserve Bank of New York. Broadway is also home to the Beacon Theatre at West 74th Street, designated a national landmark in 1979 and still in operation as a concert venue after its establishment in 1929 as a vaudeville and music hall, and "sister" venue to Radio City Music Hall. At its intersection with West 78th Street, Broadway shifts direction and continues directly uptown and aligned approximately with the Commissioners' grid. 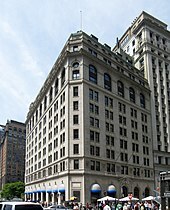 Past the bend are the historic Apthorp apartment building, built in 1908, and the First Baptist Church in the City of New York, incorporated in New York in 1762, its current building on Broadway erected in 1891. The road heads north and passes historically important apartment houses such as the Belnord, the Astor Court Building, and the Art Nouveau Cornwall. At Broadway and 95th Street is Symphony Space, established in 1978 as home to avant-garde and classical music and dance performances in the former Symphony Theatre, which was originally built in 1918 as a premier "music and motion-picture house". At 99th Street, Broadway passes between the controversial skyscrapers of the Ariel East and West. At 107th Street, Broadway merges with West End Avenue, with the intersection forming Straus Park with its Titanic Memorial by Augustus Lukeman. Broadway then passes the campus of Columbia University at 116th Street in Morningside Heights, in part on the tract that housed the Bloomingdale Insane Asylum from 1808 until it moved to Westchester County in 1894. Still in Morningside Heights, Broadway passes the park-like campus of Barnard College. Next, the Gothic quadrangle of Union Theological Seminary and the brick buildings of the Jewish Theological Seminary of America with their landscaped interior courtyards face one another across Broadway. On the next block is the Manhattan School of Music. Broadway then runs past the proposed uptown campus of Columbia University, and the main campus of CUNY–City College near 135th Street; the Gothic buildings of the original City College campus are out of sight, a block to the east. Also to the east are the brownstones of Hamilton Heights. Hamilton Place is a surviving section of Bloomingdale Road, and originally the address of Alexander Hamilton's house, The Grange, which has been moved. Broadway achieves a verdant, park-like effect, particularly in the spring, when it runs between the uptown Trinity Church Cemetery and the former Trinity Chapel, now the Church of the Intercession near 155th Street. NewYork–Presbyterian Hospital lies on Broadway near 166th, 167th, and 168th Streets in Washington Heights. The intersection with St. Nicholas Avenue at 167th Street forms Mitchell Square Park. At 178th Street, U.S. 9 becomes concurrent with Broadway. The northwestern corner of the park marks the city limit and Broadway enters Yonkers, where it is now known as South Broadway. It trends ever westward, closer to the Hudson River, remaining a busy urban commercial street. In downtown Yonkers, it drops close to the river, becomes North Broadway and 9A leaves via Ashburton Avenue. Broadway climbs to the nearby ridgetop runs parallel to the river and the railroad, a few blocks east of both as it passes St. John's Riverside Hospital. The neighborhoods become more residential and the road gently undulates along the ridgetop. In Yonkers, Broadway passes historic Philipse Manor house, which dates back to colonial America. It remains Broadway as it leaves Yonkers for Hastings-on-Hudson, where it splits into separate north and south routes for 0.6 miles (1.0 km). The trees become taller and the houses, many separated from the road by stone fences, become larger. Another National Historic Landmark, the John William Draper House, was the site of the first astrophotograph of the Moon. In the next village, Dobbs Ferry, Broadway has various views of the Hudson River while passing through the residential section. Broadway passes by the Old Croton Aqueduct and nearby the shopping district of the village. After intersecting with Ashford Avenue, Broadway passes Mercy College, then turns left again at the center of town just past South Presbyterian Church, headed for equally comfortable Ardsley-on-Hudson and Irvington. Villa Lewaro, the home of Madam C. J. Walker, the first African-American millionaire, is along the highway here. 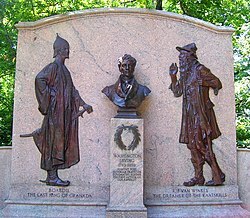 At the north end of the village of Irvington, a memorial to writer Washington Irving, after whom the village was renamed, marks the turnoff to his home at Sunnyside. Entering into the southern portion of Tarrytown, Broadway passes by historic Lyndhurst mansion, a massive mansion built along the Hudson River built in the early 1800s. North of here, at the Kraft Foods technical center, the Tappan Zee Bridge becomes visible. After crossing under the Thruway and I-87 again, here concurrent with I-287, and then intersecting with the four-lane NY 119, where 119 splits off to the east, Broadway becomes the busy main street of Tarrytown. Christ Episcopal Church, where Irving worshiped, is along the street. Many high quality restaurants and shops are along this main road. This downtown ends at the eastern terminus of NY 448, where Broadway slopes off to the left, downhill, and four signs indicate that Broadway turns left, passing the Old Dutch Church of Sleepy Hollow, another NHL. The road then enters Sleepy Hollow (formerly North Tarrytown), passing the visitors' center for Kykuit, the National Historic Landmark that was (and partially still is) the Rockefeller family's estate. Broadway then passes the historic Sleepy Hollow Cemetery, which includes the resting place of Washington Irving and the setting for The Legend of Sleepy Hollow. 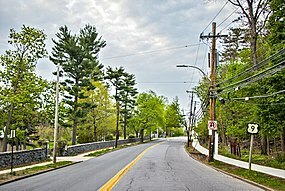 Broadway expands to four lanes at the trumpet intersection with NY 117, where it finally ends and U.S. 9 becomes Albany Post Road (and Highland Avenue) at the northern border of Sleepy Hollow, New York. While typical sports championship parades have been showered with some 50 tons of confetti and shredded paper, the V-J Day parade on August 14–15, 1945 – marking the end of World War II – was covered with 5,438 tons of paper, based on estimates provided by the New York City Department of Sanitation. The most recent parade up the Canyon of Heroes took place on July 10, 2015 for the United States women's national soccer team in honor of their 2015 FIFA Women's World Cup championship. "The Great White Way" is a nickname for a section of Broadway in Midtown Manhattan, specifically the portion that encompasses the Theater District, between 42nd and 53rd Streets, and encompassing Times Square. In 1880, a stretch of Broadway between Union Square and Madison Square was illuminated by Brush arc lamps, making it among the first electrically lighted streets in the United States. 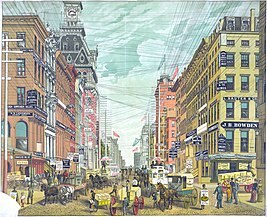 By the 1890s, the portion from 23rd Street to 34th Street was so brightly illuminated by electrical advertising signs, that people began calling it "The Great White Way". When the theater district moved uptown, the name was transferred to the Times Square area. The phrase "Great White Way" has been attributed to Shep Friedman, columnist for the New York Morning Telegraph in 1901, who lifted the term from the title of a book about the Arctic by Albert Paine. The headline "Found on the Great White Way" appeared in the February 3, 1902, edition of the New York Evening Telegram. Early morn on Broadway, the same light that tips the mountain tops of the Colorado canyons gradually discloses the quiet anatomy, the bare skeletons of the huge iron signs that trellis the sky, now denuded of the attractions of the volcanic night. Almost lifeless, the tired entertainers of the night clubs and their friends straggle to their rooms, taximen compare notes and earnings, the vast street scene has had its curtain call, the play is over. Dear old Broadway, for many years have I dwelt on your borders. I have known the quiet note of your dawn. Even earlier I would take my coffee at Martin's, at 54th Street–now, alas, vanished–where I would see creatures of the night life before they disappeared with the dawn. One night a celebrated female impersonator came to the restaurant in all his regalia, directly from a club across the street. Several taximen began to poke fun at him. Unable any longer to bear their taunts, he got up and knocked all the taximen out cold. Then he went back to the club, only to lament under his bitter tears, "See how they've ruined my dress!" Gone are the old-time Broadway oyster bars and chop houses that were the survivors of a tradition of their sporting patrons, the bon vivants of Manhattan. Gone are the days when the Hoffman House flourished on Madison Square, with its famous nudes by Bouguereau; when barrooms were palaces, on nearly every corner throughout the city; when Steve Brodie, jumping from Brooklyn Bridge, splashed the entire country with publicity; when Bowery concert halls dispensed schooners of beer for a nickel, with a stage show thrown in; when Theis's Music Hall still resounded on 14th Street with its great mechanical organ, the wonder of its day, a place of beauty, with fine paintings and free company and the frankest of female life. Across the street was Tammany Hall, and next to it Tony Pastor's, where stars of the stage were born. Tony himself, in dress clothes and top hat, sang his ballads, a gallant trouper introducing Lillian Russell and others to fame through his audience. Plan of 1868 for an "arcade railway"
From south to north, Broadway at one point or another runs over or under various New York City Subway lines, including the IRT Lexington Avenue Line, the BMT Broadway Line, IRT Broadway–Seventh Avenue Line, and IND Eighth Avenue Line (the IND Sixth Avenue Line is the only north-south trunk line in Manhattan that does not run along Broadway). The IRT Lexington Avenue Line runs under Broadway from Bowling Green to Fulton Street (4 and ​5 trains). The BMT Broadway Line runs under it from City Hall to Times Square–42nd Street (N, ​Q, ​R, and ​W trains). The IRT Broadway–Seventh Avenue Line runs under and over Broadway from Times Square to 168th Street (1, ​2, and ​3 trains), and again from 218th Street to its terminal in the Bronx at Van Cortlandt Park–242nd Street (1 train). 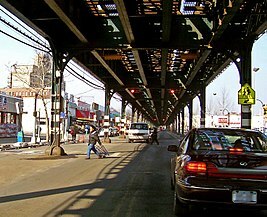 The northern portion of the IND Eighth Avenue Line runs under Broadway from Dyckman Street to Inwood–207th Street (A train). As of 2017[update], Broadway is served by the M4 (ex-FACCo 4), M7 (ex-NYCO 7), M55, M100, and M104. Other routes that use part of Broadway include the M5 (ex-FACCo 5), M10, M20, M60 Select Bus Service, Bx7, Bx9, and Bx20. Bee-Line buses also serves Broadway within Riverdale and Westchester County. Routes 1, 2, 3, 4, 6, 13, and several others run on a portion of Broadway. ^ Staff (May 29, 1893) "Some New Publication: Peter Stuyvesant's Unhappy Rule", The New York Times. Accessed June 16, 2016. "One other thing which came from the Dutch is the name of our street, Broadway, which by them was called the Breede Weg, the translation being afterward made by the English." ^ Shorto, Russell (February 9, 2004). "The Streets Where History Lives". The New York Times. Retrieved April 4, 2008. And what about a marker for the Wickquasgeck Trail, the Indian path that ran the length of the island, which the Dutch made into their main highway and the English renamed Broadway? ^ Dunlap, David (June 15, 1983). "Oldest Streets Are Protected as Landmark". The New York Times. Retrieved December 21, 2015. ^ Ellis, Edward Robb (1966). The Epic of New York City. Old Town Books. p. 26. ^ "City Notes of 1774 Up for Redemption". The New York Times. October 6, 1935. p. N1. Retrieved July 11, 2010. ^ New York City Manhattan Borough President's Office (December 1, 1897). NYC Manhattan Borough President's Office City Map Reference Map ACC 6027. Retrieved March 22, 2017 – via Wikimedia Commons. 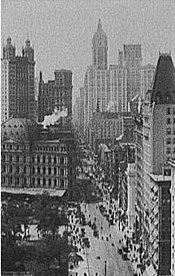 ^ February 14th in NYC History: 1899, referred to as "the 'Western' Boulevard"; called "the 'Grand' Boulevard" in The New York Times, February 1869, quoted in Michael V. Susi, The Upper West Side "Introduction", 2009:7. ^ Ingraham, Joseph C. (June 7, 1954). "7th and 8th Aves. Shift to One-Way". The New York Times. p. 1. Retrieved July 11, 2010. ^ Ingraham, Joseph C. (March 12, 1957). "New One-Way Plan Cuts Delay by 30% In Midtown Traffic". The New York Times. p. 1. Retrieved July 11, 2010. ^ Robertson, Nan (June 5, 1962). "Shifts in Traffic Marked By Jams". The New York Times. p. 1. Retrieved July 11, 2010. ^ "City to Extend One-Way Traffic to 3 Manhattan Routes Sunday". The New York Times. November 5, 1963. p. 1. Retrieved July 11, 2010. ^ Ingraham, Joseph C. (May 12, 1965). "5th and Madison Will Go One-Way Early Next Year". The New York Times. p. 1. Retrieved July 11, 2010. ^ Fowle, Farnsworth (January 17, 1966). "Barnes Suggests Express Bus Runs". The New York Times. p. 1. Retrieved July 11, 2010. ^ Donohue, Pete (July 10, 2008). "City to Make Two Broadway Lanes Bikes, Walkers Only for Seven Blocks". New York Daily News. New York. Retrieved July 11, 2010. ^ Grynbaum, Michael M. (February 11, 2010). "New York Traffic Experiment Gets Permanent Run". The New York Times. Retrieved July 11, 2010. ^ "Worth Square Project". Madison Square Park Conservancy. Retrieved May 14, 2017. ^ Dunlap, David W. "After a Decade, Disney Chief Sees New 'Flair' on 42nd St.", The New York Times, September 28, 2004. Accessed June 16, 2016. "Barely recognized by a crowd that might not have been on the block if he hadn't been there first, the man who Disneyfied Times Square walked across 42nd Street yesterday to take in a decade's worth of change.... He emerged from under the marquee of the New Amsterdam Theater, whose opulent revival in Disney's hands has been credited as a key catalyst in the redevelopment of 42nd Street." ^ Dunlap, David W. (June 10, 2007). "Copy!". The New York Times. Retrieved October 10, 2008. The sound is muffled by wall-to-wall carpet tiles and fabric-lined cubicles. But it's still there, embedded in the concrete and steel sinews of the old factory at 229 West 43rd Street, where The New York Times was written and edited yesterday for the last time. ^ Gregor, Alison. "A New Star in the Columbus Circle Orbit", The New York Times, October 18, 2006. Accessed June 16, 2016. 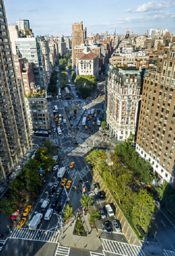 ^ "Safety Fixes Slated for One of Manhattan's Most Dangerous Intersections". Retrieved February 10, 2014. ^ Verdi Square, New York City Department of Parks and Recreation. Accessed June 16, 2016. ^ Shepard, Richard F. (April 8, 1988). "Strolling Up Broadway, The West Side's Spine". The New York Times. Retrieved April 18, 2008. ^ deCourcy Hinds, Michael (November 8, 1987). "A Conversion Plan Roils the Ansonia". The New York Times. Retrieved February 10, 2014. ^ "Amsterdammin' from West 72nd–110th". November 2010. Retrieved February 10, 2014. ^ "Beacon Theatre History". Archived from the original on February 14, 2014. Retrieved February 10, 2014. ^ "Written on the Screen" (PDF). April 21, 1918. Retrieved February 10, 2014. ^ "Symphony Space History". Retrieved February 10, 2014. ^ Straus Park, New York City Department of Parks and Recreation. Accessed June 16, 2016. ^ Lombardi, Kate Stone. "Hospital Marking Its 100th Year", The New York Times, October 16, 1994. Accessed June 16, 2016. "When lower Broadway became more urbanized, the asylum was moved to upper Manhattan, on what is now the site of Columbia University. (The area was referred to as Bloomingdale -- vale of flowers -- by early Dutch settlers, and the hospital was named the Bloomingdale Asylum.) "
^ a b c 1977–2007 I Love New York State Map (Map). I Love New York. 2007. ^ "Philipse Manor Hall State Historic Site". Retrieved October 6, 2014. ^ "Villa Lewaro". Places Where Women Made History. National Park Service. March 30, 1998. Retrieved May 31, 2009. ^ Larson, Neil (February 1987). "National Register of Historic Places nomination, Christ Episcopal Church". New York State Office of Parks, Recreation and Historic Preservation. Archived from the original on February 19, 2012. Retrieved June 11, 2008. ^ "The Original Sleepy Hollow Cemetery in New York". Retrieved October 6, 2014. ^ "Q & A: Today's Giants Ticker-Tape Parade". The New York Times. February 5, 2008. Retrieved August 4, 2008. ^ Santos, Fernanda (June 11, 2008). "Super Bowl-Winning Giants Get Canyon of Heroes Honor". The New York Times. Retrieved August 4, 2008. The plaque is one of the more than 200 granite strips in a route known as the Canyon of Heroes, marking those who have been honored by the city with ticker-tape parades. ^ Jerome Myers, Artist in Manhattan, New York: American Artists Group, Inc. 1940. ^ "NYC Subway Map" (PDF). MTA. Retrieved June 6, 2014.